We have worked with many Workfront customers who want to integrate Workfront with various legacy systems within their organization. These integrations might include financial systems (SAP, JDE, Oracle), HR systems for on-boarding new employees, helpdesk ticketing systems, or even other project management systems used elsewhere in the organization. 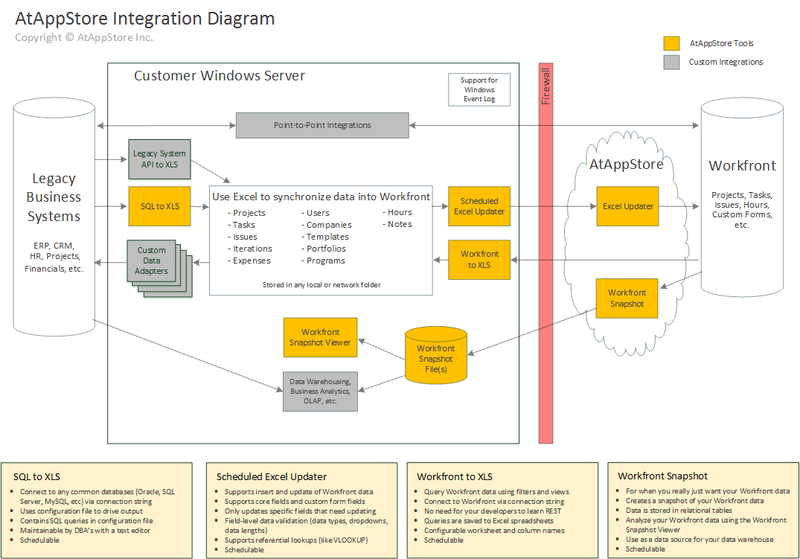 Integrations with Workfront and another system can be designed in a number of ways, to meet different scenarios. Point-to-point solutions are commonly considered, but are also the most fragile. Your organization requires software developers who are fluent in the API’s of the legacy systems, and are also fluent in the API’s of Workfront. Any new versions of either the legacy systems or Workfront could break the integration and require further software development to fix it. Tip: if you are considering point-to-point solutions, you will need to budget time for your software developers to become proficient with the Workfront API. Make sure their estimates for learning are realistic. Also factor in training of additional software developers should any employee turnover occur. 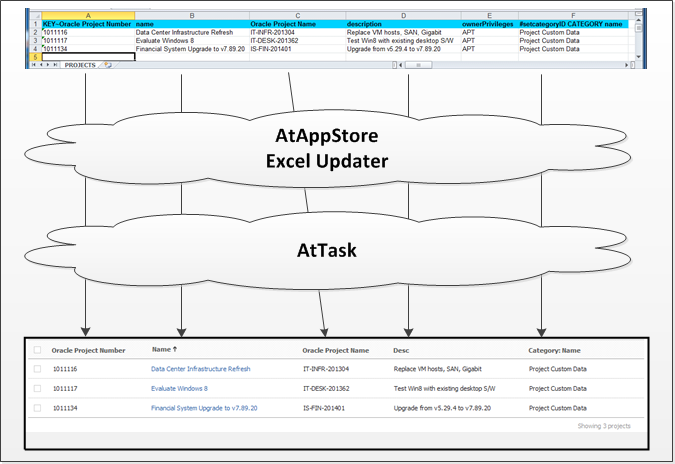 We originally developed our Excel Updater solution to solve a real need of an Workfront customer. The Workfront customer was a multi-billion dollar organization with offices across the country. Workfront was being used to coordinate hundreds of simultaneous projects. Business analysts would export the most recent project information from Workfront into a spreadsheet, then fly to a corporate office to meet with executive-level staff where they would spend two days making hundreds of changes to the spreadsheet data. Upon returning home, the analysts needed to get their changes back into Workfront. Thus Excel Updater was born. We talk more about this particular Workfront customer in our blog post “Spiral Adoption”. But other Workfront customers have a similar need: updating Workfront data fields based on data from other source systems. Rather than building a point-to-point integration, the systems can often be decoupled by using spreadsheets as the intermediary. Since Excel Updater already supports the most common types of data encountered in Workfront integrations (Projects, Tasks and Issues), your organization can save time and money by reusing what has already been built. Let your technical experts focus on the areas where they are experts. Your integrations can be up and running in hours/days instead of weeks/months! Can your source system export spreadsheets natively? In some cases this can be used to create spreadsheets that are loaded into Workfront through Excel Updater. Does your organization have a reporting tool, such as BusinessObjects? These reporting tools can be used to create spreadsheets that are loaded into Workfront through Excel Updater. Do you have DBA’s who know your source database table structure, and can write SQL queries to get the needed data? Our SQLtoXLS tool can export your query results to spreadsheets, where they can be loaded into Workfront through Excel Updater. If your organization wants to push updated data into Workfront on a regular basis, this can be automated by using our Scheduled Excel Updater. This tool scans a folder for any spreadsheets, and loads the entire folder worth of files into Workfront through Excel Updater. No need for software developers. Make changes to your integration simply by editing text configuration files. Populating a new Workfront custom form field is as simple as adding another column to your source spreadsheet. Want to save development costs? We invite you to learn about this solution below, and once you are ready, to then talk to us about loosely coupled integrations.